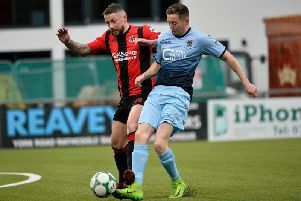 Newry City AFC manager Darren Mullan is enjoying life in the Danske Bank Premiership and is looking for his side to deliver against Glentoran at the Oval on Friday night. Mullan’s men have won two and lost three of their league games this season and had a fantastic 1-0 win against Cliftonville last weekend to leave his side on six points from five games. Tonight they face the Glens before going on to tackle Crusaders and Mullan says this is why he is in football. “This is what it is all about and if anyone had asked me at the start of the year was there anyone we feared playing against? “But we have no fear and I don’t mean that in a disrespectful way . “We are playing against very difficult sides and we know every game is going to be difficult but if you don’t enjoy playing or managing at this level there is something badly wrong. “You obviously enjoy it more if you are winning, so we have to make sure that performances are of a high standard. The Glens have been through a barren few seasons and have dropped down the rankings but Mullan is sure that the new management team of Ronnie McFall, Gary Smyth and Paul Leeman has got the east Belfast club heading in the right direction. “I have been watching highlights of their games this week and they seem to be better organised this year. “I think having Gary and Paul in there alongside Ronnie they have plenty of experience there. “I think that has been a benefit to them and they have started the season well. “By all accounts they were unfortunate against Cliftonville in the first game and they had a good draw against Glenavon last week and that is never an easy place to go. “We are expecting a really tough game and we have a few injuries - but that is what a squad is for. “Our two centre-halves are missing from last week which is a blow to us. And Mullan admits he notices a change in the pace of the game after gaining promotion at the end of last season. “There is a difference. The games are a faster, they are more intense and more physical. But we knew that and we expected that. “We knew it would be a big step up and the players have done well. We have beaten last season’s League Cup winner and Cliftonville - who are a top six side. “We have made a decent start and in the Institute and Glenavon game we could have got something out of those. “But that is the way it will be this year. There will be games we play we and not get anything out of it and then just hang in there and get something out of it. “We are enjoying ourselves so far,” said Mullan. And Glentoran goalkeeper Elliott Morris believes the Oval outfit are heading in the right direction. “We are looking good, we’ve signed some good players and we are strong at the back, with a bit of midfield quality and boys up front who will always get goals,” said Morris.